The GX5150 Series are high speed, 6U PXI, sequenced digital I/O instruments. The GX5150 master controller has 32 bits of I/O channels that supports test rates of up to 50 MHz and a vector depth of up to 128 Mb per pin. The GX5151 slave offers the same timing characteristics and multiple I/O level configurations when used in conjunction with the GX5150. The GX5150 can control up to 15 GX5151 boards using the same timing and sequencer. The GX5150 accommodates between two and nine memory SIMMs. One SIMM is used by the sequencer and the other eight by the I/O pins. Each SIMM provides 256 Kb, 1 Mb, 2 Mb or 4 Mb per pin, for a maximum of 32 Mb. The GX5150 architecture enables the user to stack the memory to reconfigure the board as a 16 pin I/O with 64 Mb depth or as 8 pin I/O providing a maximum of 128 Mb behind each pin. The GX5150’s sequencer, which resides in the ninth SIMM, enables a conditional or unconditional JUMP to two predefined addresses and PAUSE commands. The sequencer commands can be applied every eighth step. Clock and Strobe signals originate on the timing module and are distributed to the slave GX5151 via a ribbon cable. These signals can be provided externally for full synchronization with external events. The Trigger signal initiates the execution of vector capturing (or vector stimuli). The multiple software and hardware trigger sources provide flexibility in synchronizing the GX5151 with real world events. The Timing Module provides clocks, strobes, and additional timing signals to control the timing of the GX5150. The Timing Module Level Adapter (TMLA) is a daughter board that mounts on the Timing Module to change the levels according to the selected I/O module (TTL, PECL, ECL, LVDS, or programmable levels). The default TMLA is TTL. In addition, the GX5150 offers a variety of I/O modules. The I/O modules are daughter boards that mount directly onto the GX5150 board. 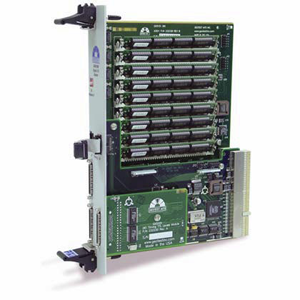 Available I/O modules include TTL, PECL, ECL, Programmable Levels, and LVDS.